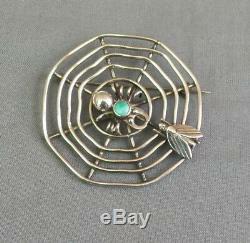 Wonderful Vintage Native American Silver Turquoise Spiderweb Spider & Fly Pin. What a great pin, don't you think? I've never seen another like it. 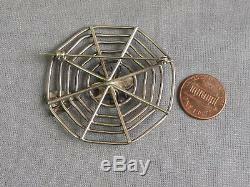 Measures 2" across the web about 2 1/8" at the fly. The item "Wonderful Vintage Native American Silver Turquoise Spiderweb Spider & Fly Pin" is in sale since Monday, June 25, 2018. This item is in the category "Jewelry & Watches\Ethnic, Regional & Tribal\Native American\Pins, Brooches". The seller is "jewelryjoy" and is located in Las Cruces, New Mexico. This item can be shipped to United States, Canada, United Kingdom, Denmark, Romania, Slovakia, Bulgaria, Czech republic, Finland, Hungary, Latvia, Lithuania, Malta, Estonia, Australia, Greece, Portugal, Cyprus, Slovenia, Japan, China, Sweden, South Korea, Indonesia, Taiwan, Thailand, Belgium, France, Hong Kong, Ireland, Netherlands, Poland, Spain, Italy, Germany, Austria, Israel, Mexico, New Zealand, Philippines, Singapore, Norway, Saudi arabia, United arab emirates, Qatar, Kuwait, Bahrain, Croatia, Malaysia, Chile, Colombia, Costa rica, Bahamas, Uruguay.